ideal location, very quiet, with all comforts, in the 2nd Floor with 2 balconies each. Rural location, free entrance to the lake, free bike rental and sledding in the house, hand and bath towels are changed Wednesdays and Saturdays. We are a member of the BIG FAMILY the adventure club of 4 - 14 years. From 24. 06. - 06. 09. 2019 and from 30. 09. - 25. 10. 2019 available. Prices are for 4 people without city tax, with more occupancy is a surcharge from EUR 20, - per person / day. 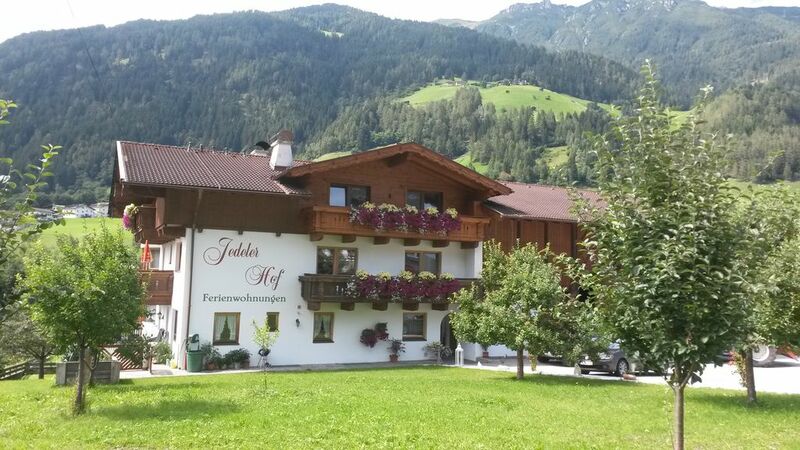 From 25.05.-20.10.209, the Stubai Super Summer Card is included in the price. For animals EUR 10, - per day will be charged. You must not stay alone in the apartment or in the beds. "The apartment was more then expected. The view and the area were equally nice. If we go back to Austria i would stay at the same place. Very very nice." "L''appartamento (top 6) è molto spazioso, accogliente, ben arredato, pulittissimo, con nuovi servizi, senza disturbi sonori. La posizione della casa è perfetta per le famiglie con i bimbi piccoli sia d''estate che d''inverno. I gentilissimi propiretari ci hanno datto gli slittini ad uso durante il soggiorno. "Séjour parfait, conforme aux prescriptions données sur le site. En plus, la propriétaire tient un petit magasin où on peut y acheter du pain fait maison , saucissons,jambons, fromages, pommes de terre etc...."
"Absolument conforme aux explications du site internet." Der Preis bezieht sich auf bis zu 4 Personen, bei weiteren Personen ist ein Aufpreis ab EUR 18,- pro Tag/Person zu bezahlen. Anzahlung / Abschlagszahlung bei der Reservierung. Preis je nach Personenzahl Vom 26.05. - 09.10.2016 ist die Stubaier Super Sommer Card im Preis inbegriffen und gilt während Ihres ganzen Aufenthaltes inkl. Anreisetag und Abreisetag.